Often in the non-profit ministry world, we are challenged on how we approach life transformation. Skeptics question whether God’s Word can really be enough to affect people’s destinies. Critics scoff and say we need to do more than proclaim God’s Word to impact young people. There are hundreds of organizations that believe social justice and compassion are the answers to changing lives. To get kids off the street, they open youth centers; to get kids off drugs, they offer detox programs. Are these things important? Absolutely! But until you address the heart of the problem, just offering compassion and supplying needs will not transform lives. Proclamation and compassion are BOTH evangelism, but rest assured that there is no justice—social or spiritual—without Jesus. Meet Jojo, born to a teen mom in Mozambique. Like many others babies born by children themselves, Jojo was raised by his grandmother. By age 13, he had quite the reputation on the streets as an accomplished thief, gambler, and more. Jojo didn’t have much going for him until a friend invited him to the Hope for Kids program at church. You would think with his behavioral habits, he wouldn’t want to darken the doors of a church, but as a street kid drawn to fun and excitement, he went. Since street kids move in packs, Jojo brought his cronies with him to the program. During the event, they sang songs, played games, saw The GodMan film and each attendee received their own Book of Hope. Jojo and his gang started studying the Book of Hope together and attending church. Soon, Jojo committed his life to Jesus Christ. Understanding what street kids crave and how to reach them, Jojo convinced the local church to organize a sports and recreation program. Today he and his friends serve as leaders in the program so they can help rescue more children and youth from a hopeless future! There are thousands of Jojo’s around the world. His story is no exception—experiencing radical life change after becoming involved with a church program and committing his life to Jesus. We began to wonder if authentic Christian teens are more “immune” than non-Christian teens to the unfavorable cultural influences surrounding them. We found that the incorporation of religious texts, positive family experiences, and involvement with a faith community make up a “trifecta” that produces spiritually vibrant teens who are better able to weather life’s storms and make wise choices even in adverse situations. After we pored through the data, we tried to ascertain whether faith truly affects the daily lives of teens and how they react to negative influences. 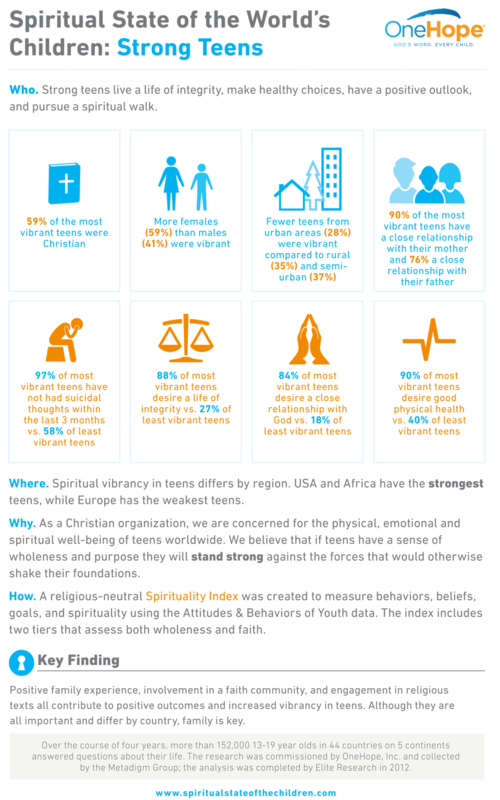 The findings of our robust religion-neutral Spirituality Index revealed that the most spiritually vibrant teens are, in fact, Christian. The reassurance of this finding fuels our passion to continue to proclaim the truths in the Word of God to youth and teens around the world. Knowing the powerful impact that a relationship with Jesus Christ has on changing the heart, and ultimately the life, of a child and having the data to back it up gives us the confidence that we need to continue to create and administer Bible-rich programs and products to transform the hearts and lives of those we are serving.